A Fulbright Award - one of the best-regarded and impactful scholarship programmes in the world - has been awarded to Professor Sandra Chapman from the University of Warwick. Professor Chapman, from the Department of Physics, will be conducting research on space weather at Boston University in the USA, after receiving the Fulbright Lloyds of London Scholar Award. The research will focus on how space weather impacts our planet – for example, power loss, aviation disruption, communication loss and disturbance to satellite systems. Professor Chapman’s work will bring data analytics to the physics of space weather, using observations from satellites and ground based stations to quantify its risk and impacts. Professor Chapman and the other 44 British grantees of the 2017-18 Fulbright cohort will celebrate their success at a reception hosted by the Foreign & Commonwealth Office on Thursday 6 July. Sandra Chapman is Professor of Physics at University of Warwick, UK. Sandra’s work is highly interdisciplinary and she has pioneered nonlinear and complex systems approaches in solar system and laboratory plasmas and more widely. She read Physics on an Exhibition Scholarship to Imperial College, London and her PhD (also at Imperial College, 1985) was on the role of chaos in space weather. Early recognition came with a COSPAR Zeldovich Medal and EGS Young Scientists' Medal. 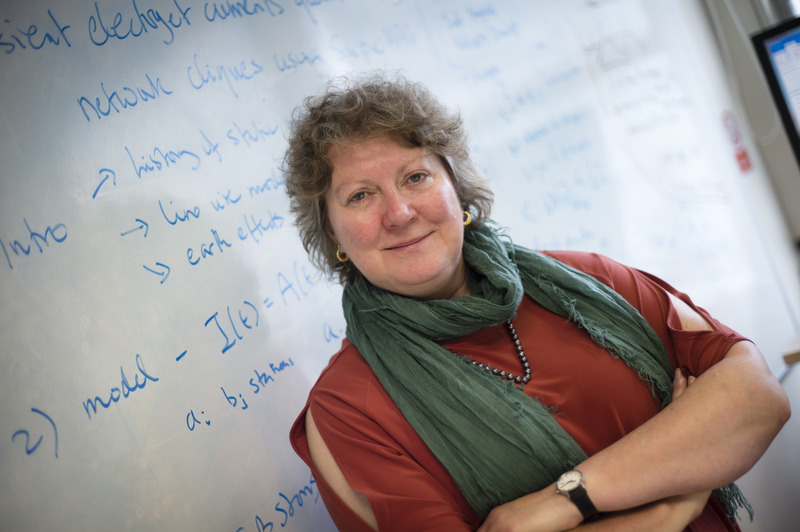 The Royal Astronomical Society awarded Sandra the 2014 James Dungey Lecture. She has held international personal research fellowships from PPARC, the Royal Society/Japan Society for the Promotion of Science, the Nuffield Foundation and the Radcliffe Institute for Advanced Study, among others. Sandra is also an artist who works to bridge the ‘arts- science divide’ and has held a NESTA Dreamtime fellowship – working as an artist with the British Antarctic Survey in Antarctica. Earth’s near-space plasma environment is highly dynamic, with its own space weather which in our ever more highly networked world can result in power and aviation disruption, communication loss and disturbance to satellite systems. Sandra will spend her Lloyds of London-Fulbright scholarship year at the world class centre for space weather research at Boston University, and at other centres of excellence across the USA. Notes to Editors: Full details regarding the Awards, including the selection criteria, benefits and Awards categories, can be found on the Fulbright website. About the US-UK Fulbright Commission: The US-UK Fulbright Commission was founded by diplomatic treaty in 1948, to foster intercultural understanding between the United States of America and the United Kingdom of Great Britain and Northern Ireland through educational exchange. The Fulbright Commission is part of the scholarship programme conceived by Senator J William Fulbright in the aftermath of World War II to promote leadership, learning and empathy between nations through educational exchange. Award recipients will be the leaders of tomorrow and support the special relationship between the US and UK. The Commission continues to support Senator Fulbright’s vision through our scholarship and summer programmes, enabling British and American citizens to study, research or teach at universities on either side of the Atlantic. There have been over 27,000 Fulbright exchanges between our two countries so far. Prominent alumni of the US-UK Fulbright programme include poet Sylvia Plath; politician Charles Kennedy; journalist, author and Fulbright Commissioner Toby Young; and the economist and Nobel Laureate Milton Friedman. Image: Professor Sandra Chapman (click image for high-res).